I just entered my third trimester and my skin is even drier than usual. 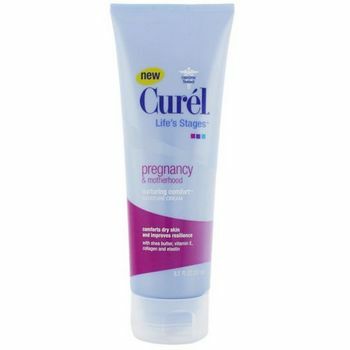 I’m loving Curél® Life’s Stages® nurturing comfort® Moisture Cream (price range $7.79 – $15), which was developed with OB/GYNs to hydrate dry skin during pregnancy. The cream is fast-absorbing cream (meaning you’re not sitting there with gooky stuff). Plus it also feels heavenly going on and my skin is soft and hydrated now! Its paraben-free and free of mineral oil, and contains shea butter, Vitamin E, collagen and elastin. Curél® Life’s Stages® nurturing comfort® Moisture Cream is widely available. Thank you to Curel for sending a product sample. I have just entered third trimester and I have just started to use Curél® Life’s Stages® nurturing comfort® Moisture Cream and I just love it. It’s fragrance free and makes my dry skin soft and silky. A perfect moisture cream for dry skin. I will continue using product and would recommend it to everyone. Where did you buy it? A friend gave me some and I absolutely love it but can’t find more ANYWHERE!